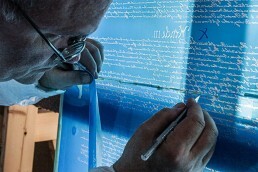 I recently completed a mammoth effort to meticulously hand trace each line of the U.S. Constitution for a carved glass installation. This process ensured the ability to produce a high quality image when enlarging the document to 42″ x 60″ and maximum flexibility during the carving process. Using a digital pen tablet, I created a precise vector line art drawing applying various calligraphic brushes to maintain the unique characteristics of the original document – a process that took approximately 80 hours to complete. 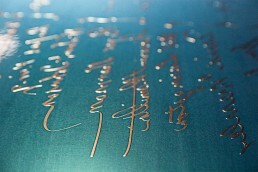 A mask was then produced by photoresist, a technique that utilizes light-sensitive materials to form a patterned coating that is then applied to a mask substrate. 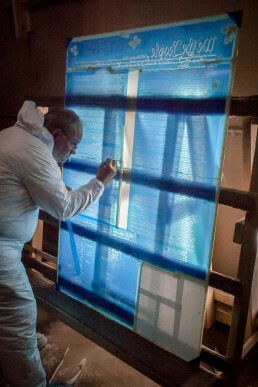 The mask protects the glass while areas intended for sandblasting are removed during the carving process. 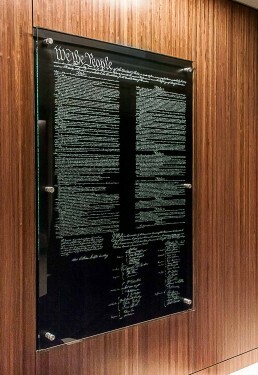 Over the course of several days Classic Glass artisan, Mike Seidel sandblasted the Constitution image into the panel. 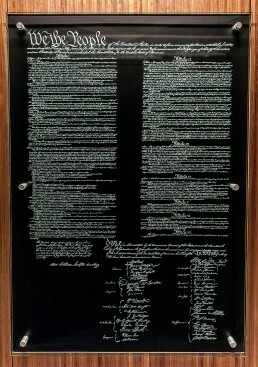 For maximum impact, Seidel deeply sculpted areas such as the Preamble and the founder’s signatures at a deeper depth than the rest of the document. The U.S. Constitution contains 7,591 words including the 27 amendments and signatures. Forty signatures including George Washington and James Madison who are the only Presidents that signed the U.S. Constitution. It took one hundred days to “frame” the U.S. Constitution. The final result is a one of a kind carved glass sculpture of one of the most enduring political agreements in the history of the world.